mixers for some special spooky cocktails. 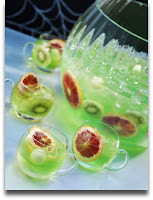 Why not try Halloween Punch – perfect for parties, or Trick or Treat a ghoulishly good ‘shotail’? Pour ingredients in order listed into a pitcher filled with cubed ice. Shake and stir for about 5 seconds. Strain from pitcher into punch bowl. Garnish with melon balls, red oranges and kiwi for a frightfully fabulous Halloween party centrepiece! To make this devilishly simple ‘shotail’ pour the ingredients carefully into a shot glass to keep the green and black layers separate, and enjoy the cauldron of liquorice and melon flavours! Midori was conceived by the international award-winning Suntory group in 1978. Its premium production partners a honeydew melon liqueur base with a clear grain spirit. Midori is stocked by Asda, Morrisons and Sainsbury’s and is available in 70cl and 50cl sizes. Guide retail price is £9.34 to £14.85.